A very busy was held grading in Bolton at Thornleigh High School on Sunday 24th March with students attempting grades from orange belt right up to 1st Kyu. There was plenty of help on hand from our Instructor team to make sure that the day ran as smoothly as possible and all the students earned their first or next belts. Gradings of this size really are a mammoth task to put together but our team of Instructors are absolute diamonds. Thank you so much to all of you for everything from making sure the students are fully ready to grade, to setting up, putting out chairs, signing in, teaching, looking after the students, handing our certificates and belts and so on. We really couldn’t do it without you all. Thanks as always to Paul Towler who kindly took some great photographs on the day, you can view, download and share them by clicking the link below. Printed copies of your picture with your Instructor will be available to collect at classes this week. There were plenty of brand new white belts grading for the very first time and they all did really well. They were very enthusiastic and worked hard from beginning to end. There were plenty of young children who would normally only train for an hour (maximum) who had to concentrate and work for double that time to get their belts. 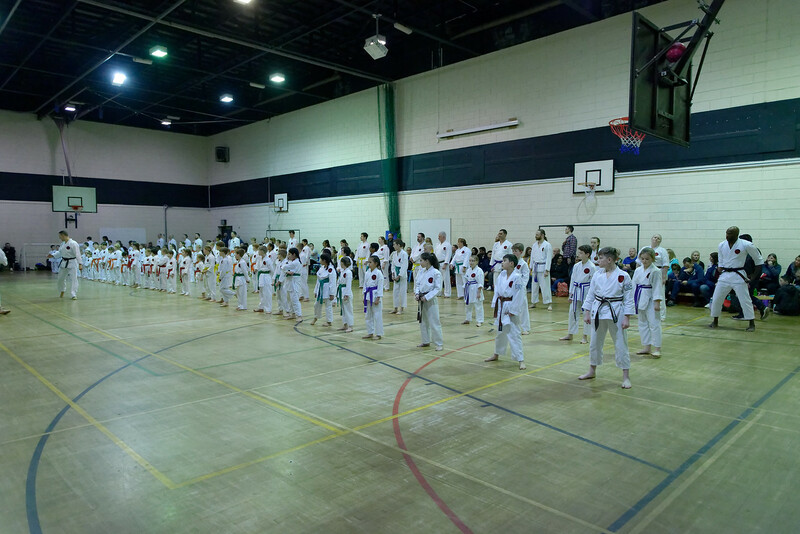 Well done to Su Sensei who sent her first batch of students to grading from Heywood, they all did a fantastic job. Congratulations to you all for passing the first test towards getting that Black Belt and keep up the fab work. We also had lots of students grading to red and yellow belt which is a testament to our Instructors and how hard they work at retaining their students. We used to lose a lot of students after their first full grade, but now we are seeing more and more people staying around, progressing through the ranks and enjoying their training. Congratulations to everyone who got their red and yellow belts and carry on what you are doing, you were all brilliant. There was a fab little group of green belts who have been with John O’ Donovan Sensei since he first opened the Chantlers class. Adam, Alex, Kennedy, Holly and Katie all did great, well done. There were also three adults grading to green belt Adam Ginn, Tammy Carter and Thurston Cassidy. All 3 did really well and worked extremely hard. Keep it up. We saw a fair few students progress from green to purple belt and there was some outstanding students who showed some excellent potential. We do hope they all keep it up and continue to improve. Hannah Towler from Darwen in particular was a stand out and was awarded Student of the Grading for her exceptional performance. Well done missus. Congratulations also to Callum, Harris, John, Harry, Zahra, Hanna, Tom and Austin who all progressed to their purple belts and the two adults Debbie and Ewan, you were all fantastic, well done. Three students progressed to 4th Kyu Purple and white belt; Anthony Cristoforo, Bradley Oliver and Maisie Fu. All three gave exceptional performances and are progressing very well indeed. Keep it up. There were 4 students who earned their 3rd Kyu brown belt, 4 students who earned their 2nd kyu and 1 student who earned his 1st Kyu. They were all pushed really hard at this level and gave us everything they had. Biggest congratulations is reserved for this group as they push towards their Black Belts in the very near future. Elliot Rigby – Excellent performance by Elliot who has made lots of improvement between 4th and 3rd Kyu. He trained hard throughout the grading and is making steady progress towards his Black belt. Keep training, working hard and listening to your Instructors and you’ll be even more brilliant. Well done. Paul Evans – Paul is such a hardworking and dedicated student and is a pleasure to teach. He continues to plug away and tries hard to make improvement, this is how you go from good to great and Paul is on his way! He was utterly exhausted by the end and even had half of the skin on his big toe hanging off but he still carried on and finished the grading without complaint. What a hero! Well done and I hope it comes back quickly! Daniel Ingham – What fantastic improvement Daniel has made in the last 12 months. He’s always been talented and now has tghe work ethic to match. He performed really well in all areas especially the kumite and has improved the presentation of his katas by loads. Keep up the fab work Daniel, what a star. Danika Wood – What a little sweetheart. Danika has been training with us for many years and is absolutely cute as a button! But make no mistake she is not to be messed with, she a tough little cookie who seems to have turned a corner with her training. We were so impressed with the progress she has made and her great attitude. Well done missus and keep up the great work. William Cristoforo – Now this young man is A-M-A-Z-I-N-G! We all absolutely love teaching William because he is just brilliant. There’s nothing he can’t do. He gives you 100% every lesson and leads by example. His behavior, effort and focus is superb. For his age, they don’t come much better than William. You won’t find a single part of his karate that isn’t from the top drawer, he’s just awesome. You find something he needs to correct, he does it there and then.This lad has black belt written all over him and we couldn’t be more pleased to have him training with us. A future Student of the Year I hear you say? I certainly think so. Keep it up batman! Ava Staton – This young lady is absolute quality. She’s very dedicated and is making excellent progress towards that Black Belt. She was calm and seems to have grown in confidence between 3rd Kyu and 2nd Kyu and we were really impressed with all parts of her karate. She has no weak areas and if she continues to improve at this rate, she’ll be awesome by the time she goes for Black Belt. Caroline Wood – Great performance by Caroline who gave it 100% effort from start to finish. She always works really hard is making steady progress. Her Katas look like they’ve been worked on and her combinations were a good standard. Keep up the great work and I’m sure you’ll continue to improve as you approach Black Belt well done. Betty Eccles – Awwww little Betty has been training with us for many years and she is doing brilliantly. She tried really hard from beginning to end and we couldn’t have asked for more. Her karate has improved so much and she is definitely too hard on herself. For her age, to remember all of those katas and everything we expect of these little ones, she is amazing and should be so proud of herself. Things may not have gone fully to plan in the kata section but when she was given a second chance she absolutely smashed it. That’s what its all about. Never give up! Betty, you are a star – well done! Ruben Smith – Now Ruben Smith has some serious talent. We have always known this and are probably a bit tough on him at Darwen because of it. We know he is capable of performances like this one. He was nothing short of exceptional. He led the grading not just because he was the highest graded student there, but because he was the top of the shop, the number 1, the hardest worker in the room and the man to beat! He set the standard for others to follow and that is exactly what a 1st Kyu should do. Trouble is, when we know that you can be this good, you Instructors want to see it EVERY LESSON. It’s the only way to fulfill your enormous potential. You 100% deserved your 1st Kyu and people will remember your name and look forward to seeing you do your Black Belt. Let’s work together every lesson to make sure that you continue to improve and meet those expectations! Congratulations Reuben, you are one tough young man. Thanks to the parents and supporters who make sure the students are able to train every week. Without your help, they wouldn’t be able to achieve any of this.